Some Jewish scholars had calculated that the date of Creation was March 25, and it made sense to believe that, since a new creation began upon the Incarnation, Jesus was conceived on the same day as the first creation. The opinion that the Incarnation also took place on March 25th is found in the pseudo-Cyprianic work “De Pascha Computus”, c. 240. Our Lady announced to St. Bernadette at Lourdes that She is “The Immaculate Conception” on March 25th 1858, four years after the dogma of the Immaculate Conception was proclaimed. …and the immolation/ sacrifice of Isaac by his father Abraham. St Patrick arrived in Ireland on March 25, 433, at Slane. One legend says that he met a chieftain of one of the tribes, who tried to kill Patrick. Patrick converted Dichu (the chieftain) after he was unable to move his arm until he became friendly to Patrick. Under charter granted to Lord Baltimore and led by his brother Leonard Calvert the first settlers to the new world found the Catholic colony of Maryland on March 25th 1634 ~! The Annunciation to Mary by the angel Gabriel that she was to be the Mother of God (Luke, 1), the Word being made fiesh through the power of the Holy Spirit. The feast of the Annunciation, called also in old calendars the feast of the Incarnation, is celebrated 25 March. It probably originated about the time of the Council of Ephesus, c.431, and is first mentioned in the Sacramentary of Pope Gelasius (died 496). When Leonard Calvert and the Maryland colonists arrived in the New World, England celebrated the beginning of the new year on March 25. The practice of celebrating the new year on the 25th of March dates back to the early medieval period when the Catholic Church established a calendar which recognized a year as beginning in late March with the Feast of the Annunciation of the Virgin Mary (March 25). In England, the Feast of the Annunciation was called Lady’s Day and most legal arrangements, contracts, leases, and such were structured around this date. The calendar year was divided into quarters with religious feast days marking the periods. These feast days were called quarter days. In most of England, the quarter days were Lady’s Day, the Feast of the Annunciation of the Virgin Mary (March 25th); Midsummer Day, the Feast of St. John the Baptist (June 24); Michaelmas, the Feast of the Archangel Michael (September 29); and Christmas, the Feast of the Birth of Jesus (December 25). Also of note were the cross quarter days which divided each quarter in half. These include Candlemas, the Feast of the Purification of Mary, (February 2); May Day, the Feast of Sts. Philip and James (May 1); Lamas, the Feast of St. Peter Delivered from Prison (August 2); and All Saints Day, the Feast of All Saints (November 1). Rents that were due quarterly had to be paid on these days and various other religious and legal activities were timed to these feast days. When the colonists chose to officially take command of the new land on March 25, while still at St. Clement’s Island, they were picking a day that had considerable symbolism for them and their countrymen. Not only was it the new year, but it was an important religious feast day that celebrated the Roman Catholic commitment to the veneration of Mary. Date choices were not random but instead highly meaningful. We see this in the alignment of the foundations for the brick chapel at St. Mary’s City. Catholic liturgical practice called for churches to be aligned on a true east-west orientation. Evidence of the first Catholic chapel that stood on the site (before the Brick Chapel of 1667, which is being reconstructed) is reflected in burials. However, the Brick Chapel of 1667 is aligned at 11 degrees off of a true east-west orientation as are the human burials associated with it. Why ? There is also a tradition of orienting religious buildings to the rising sun on the feast day of the saint to whom the church is dedicated. Through careful calculation, we have determined that the sun rises directly in line with the church foundations on February 2, Candlemas, which is the feast of the Purification of Mary. Was the brick chapel in St. Mary’s City in the colony of Maryland dedicated to the Virgin Mary? It seems quite likely and on reflection doesn’t seem all that surprising given the Roman Catholic veneration of Mary as a saint. When the colonists chose to officially take command of the new land on March 25, while still at St. Clement’s Island, they were picking a day that had considerable symbolism for them and their countrymen. Not only was it the new year, but it was an important religious feast day that celebrated the Roman Catholic commitment to the veneration of Mary. Date choices were not random but instead highly meaningful. We see this in the alignment of the foundations for the brick chapel at St. Mary’s City. Catholic liturgical practice called for churches to be aligned on a true east-west orientation. Evidence of the first Catholic chapel that stood on the site (before the Brick Chapel of 1667, which is being re-built) suggests a clear east-west alignment and this alignment is reflected in the earliest burials. However, the Brick Chapel of 1667 is aligned at 11 degrees off of a true east-west orientation as are the human burials associated with it. Why ? There is also a tradition of orienting religious buildings to the rising sun on the feast day of the saint to whom the church is dedicated. Through careful calculation, we have determined that the sun rises directly in line with the church foundations on February 2, Candlemas, which is the feast of the Purification of Mary. Was the brick chapel in St. Mary’s City in the colony of Maryland dedicated to the Virgin Mary? It seems quite likely and on reflection doesn’t seem all that surprising given the Roman Catholic veneration of Mary as a saint. Three hundred years ago, England refused to accept the Gregorian Calendar as a dreaded Papist creation. So, dates in England were ten days different than most of the rest of Europe in the 17th century. And since the new year was different, March 25 rather than January 1, dates that occurred between January 1 and March 25th were part of the prior year in England while part of the current year in the rest of Europe. This led to the use of year dates that incorporated a slash—so that December 12 would be 1634 while February 14 would be 1634/5 and March 29 would be 1635. These dates are sometimes denoted with the abbreviations O.S. (old style or Julian calendar) or N.S. (new style or Gregorian calendar). All of this confusion ended in 1752 when England finally accepted the Gregorian calendar. By that point, a full 11 days had crept in to the difference between Julian calendar dates and the Gregorian calendar. In 1752, the English Parliament decreed that September 2, 1752 would be followed by September 14, 1752 and that January 1 would be the beginning of the new year. So George Washington was born on February 11th under the Julian calendar which became February 22 under the Gregorian calendar after England and her colonies changed their date reckoning. It must have been difficult for those who were born between September 3 and September 13 in the year 1752 since they got a year older but never had a birthday party! a publication of St. Mary’s College of Maryland. Pope Francis elected in 2013 (the former Cardinal Bergoglio) is from Argentina, the country that began the movement to declare the March 25 Annunciation feast date as the Day of the Unborn Child in 1998. As cardinal he wrote the introduction to a book on devotion to the unborn Christ in the womb of Mary (“María , el primer Sagrario” by J. de Mouriño), and spoke on the significance of the Annunciation as Day of the Unborn Child. In England, this feast day still determines the end of the tax year for income tax payments — April 5, which is March 25th if one subtracts the eleven extra days added with the adoption of the Gregorian calendar. Until the mid-18th century, England used a version of the Julian calendar, in which the March 25th Annunciation feast was the first day of the civil New Year. The date of March 25th was chosen by Pope Saint John Paul II to promulgate his 1995 “Evangelium Vitae” (Gospel of Life) upholding the teaching on the sanctity of all human life, especially the unborn. One beautiful Annunciation custom from Russia is to release white pigeons or doves (symbolic of the Holy Spirit) on the feast day to represent the Incarnation’s liberation of humanity. Several hospitals in Hungary announced they would stop aborting children on March 25th and other holy days after an interdenominational group of bishops led by the Alfa Alliance’s Imre Teglasy held prayer vigils outside, placing special emphasis on the March 25th Annunciation and the December 28th feast of the Holy Innocents. Pope Saint John Paul II specifically chose Nazareth and the March 25th Annunciation feast as the place and time to celebrate the Great Jubilee in 2000 during his week-long pilgrimage to the Holy Land — he did so to bring the message of the Incarnation to the world via celebration of a public Mass and his homily. Several years earlier he had released the document Tertio Millennio Adveniente announcing plans for the Great Jubilee celebrations in the Holy Land and stressing the importance of understanding the Incarnation in preparation for the new millennium. Most Christians asked where the Incarnation took place would answer incorrectly–citing the place of the Nativity rather than the site of the Annunciation. Apparitions in Betania, Venezuela were reported on March 25, 1984–the same day Pope Saint John Paul II consecrated the world to the Immaculate Heart of Mary. The events were detailed in Ch.17, (pg. 242-260) of “Those Who Saw Her” (1995 Rev. Ed.) by Catherine M. Odell: At a farmhouse in a town named Betania (meaning Bethany), flowers had been placed to decorate a man-made grotto for the Annunciation feast date gathering, and several times that day over 100 people (including atheists and agnostics) reported seeing an image of Mary (who some saw holding the infant Christ) above a nearby waterfall. The farm’s owner, Maria Esperanza de Bianchini, from childhood had been having visitations from Mary who at one point told her she would appear to her for the first time at this site on the Annunciation feast–March 25, 1976. That year she reported the message about the impending March 25th apparition to Bishop Bernal of their diocese who assigned priests to celebrate Mass and Reconciliation there. One year after that first apparition, on March 25, 1977, Mary again appeared at the farm to 15 people, and later Esperanza learned from Mary that more would see the next March 25 apparition, and that sacramental preparation for the poorest of their community should be accomplished before March 25th–the apparition occurred on the usual Annunciation feast date which in 1978 was also Holy Saturday. In the early 1980s Mary told Esperanza that many people would see her on March 25, 1984 (which occurred on the same day Pope Saint John Paul II made the collegial consecration). That well-documented and investigated apparition (approved by Bishop Pio Ricardo of the Los Teques diocese in 1987) plus the healings and miraculous occurrences that followed drew crowds as large as thirty-thousand people to the little nearby village–on the 25th of each month. For St. Elizabeth Ann Seton, the first U.S. born person to be canonized a saint, March 25th would figure importantly in her faith journey on several occasions. After converting to Catholicism she received her first Holy Communion on the March 25th Feast of the Annunciation in 1805. Then in 1809 she founded the Daughters of Charity and made her first profession of vows on the Annunciation feast day of March 25. After 1813 she and the Sisters of Charity made their annual vows on the March 25th Annunciation feast date. In 2004 on the March 25th feast of the Annunciation, Cardinal Edward M. Egan of New York established the Sisters of Life as a religious institute (click & scroll halfway down to read more) of diocesan right. This was done at the direction of the Vatican’s Congregation for Institutes of Consecrated Life and Societies of Apostolic Life. The most prominent theory of the origin of April Fool’s Day proposes it as a vestige of the change from the March 25th New Year to January 1st: In the older tradition March 25th began an eight-day New Year’s celebration extending through April 1st. When the new calendar was introduced, not everyone wanted New Year’s Day moved to January, and those who insisted on keeping the old New Year and preserving the long celebration of it into the first day of April were called “April Fools”–thus April 1st became April Fool’s Day. During the course of the 1858 Lourdes apparitions of Mary (approved by the Catholic Church), it was on the March 25th Feast of the Annunciation that “the lady” revealed her identity to the young Bernadette Soubirous (later to become canonized as a saint). At the request of Pope Pius XII one of the churches built at the site (the Basilica of St. Pius X) was consecrated on March 25, 1958 — one hundred years after the apparitions — by the Patriarch of Venezia, cardinal Angelo Roncalli, the future Pope John XXIII. Marlene Watkins, foundress of North American Lourdes Volunteers noted that the annual Lourdes pilgrimage season begins on or near March 25th (from interview on the 5/15/2011 EWTN airing of “Sunday Night Prime with Fr. Groeschel”). St. Therese of Liseux’s earnestly desired early entrance into religious life (for which she sought a Papal audience in Rome) was finally achieved during the community’s celebration of the Feast of the Annunciation in 1888. (She had hoped it would happen on the previous Christmas Day, but later realized that many graces came to her in the interim delay.) The actual date of her entrance into the Carmel convent was April 9th–she notes in the first line of chapter 7 in her autobiography “Story of a Soul,” that the feast was “transferred because of Lent.” This saint, known as “The Little Flower,” also makes a passing reference in her autobiography to the continuity of Jesus’s pre- and post-natal childhood and Mary’s maternal relationship with Him: “…Mary had carried Jesus in her arms, having carried Him in her Virginal womb.” From Chapter 6 of “A Story of a Soul,” 3rd ed., trans. from the original manuscripts by John Clarke, O.C.D. “Lives of the Saints: For Every Day of the Year” points out that the March 25 “Annunciation of Our Lord” is a “double feast” celebrating both the angel’s meeting with Mary and “the Incarnation of the Son of God” on this same occasion. “On this same day, God the Son, the Second Person of the Blessed Trinity, by the power of the Holy Spirit, assumed a human body and a human soul, and became the Son of Mary.” Source: “Lives of the Saints: For Every Day of the Year–In Accord with the Norms and Principles of the New Roman Calendar” [Imprimatur] — Rev. of the Original Ed. of Rev. Hugo Hoever, S.O.Cist., Ph.D., Catholic Book Pub. Co, N.Y., c. 1974-1955, p. 119 (entry for March 25). On the subject of the Incarnation, Joseph Kung, President of the Cardinal Kung Foundation (dedicated to raising awareness of the persecuted underground Catholic Church in China), said that at Mary’s “Yes” the eternal Son of God had “a new home in his mother’s womb.” Source: “Christmas 2013” newsletter, Cardinal Kung Foundation, Stamford, CT.
A charming image of a day in the active life of the unborn Christ is painted in one version of the unbiblical offbeat lyric of the Cherry Tree Carol dating back to circa 1400. In the song’s storyline, when the expectant Mary’s wish for cherries goes unfulfilled, “Jesus intervenes from the womb and the tree bows down to deliver the fruit to the Virgin Mary” at the divine infant’s command. 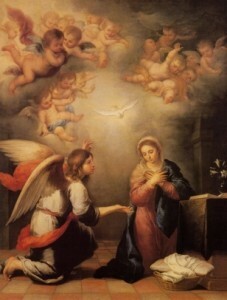 In 2012, the Annunciation feast was chosen as the day to announce the Vatican’s approval of the publication of the “Rite for the Blessing of a Child in the Womb.” A LifeNews.com article noted that the blessing, which can be offered both within and outside of Mass, “was prepared to support parents awaiting the birth of their child, to encourage parish prayers for and recognition of the precious gift of the child in the womb, and to foster respect for human life within society.” On the significance of the date selected for the announcement, the article quoted Cardinal Daniel DiNardo of Galveston-Houston, chairman of the Committee on Pro-Life Activities of the U.S. Conference of Catholic Bishops, who said, “I can think of no better day to announce this news than on the feast of the Annunciation, when we remember Mary’s ‘yes’ to God and the incarnation of that child in her the womb that saved the world.” To read the full article click here. Source: Article by Steven Ertelt, “Vatican Approves New Blessing for Unborn Children” reported by LifeNews.com, 3/26/12, Washington, DC. The companion guide to Mel Gibson’s film The Passion of The Christ, entitled “Guide to the Passion: 100 Questions,” points out in the first few pages the recent reawakening to the significance of the Annunciation as the beginning of Christ’s life–the answer to the “Incarnation” question noted that increasingly the Feast of the Annunciation is being celebrated on March 25th in honor of that most important event of history. The Institute of the Incarnate Word was founded on March 25th, 1984 in Argentina (the country that later began the tradition of celebrating the date as Day of the Unborn Child). This Catholic men’s religious congregation, also known as “the IVE” from its title in Spanish, “Instituto del Verbo Encarnado” celebrates its anniversary on the Feast of the Annunciation, even when it is moved to a different date. Although Christians and Muslims have very different understandings of the Annunciation, the fact that both faiths agree that it was an important and blessed event inspired recent efforts in Lebanon to recognize it as an unprecedented joint national holiday for both faiths. On March 30, 2013 a Lebanon TV channel aired a special on this aspect of the Annunciation entitled:Kitab Edition Speciale – Islamic-Christian National Holiday (Program description: “From the Annunciation to the Resurrection a long path in faith and religion…The 25th of March, Feast of the Annunciation, an Islamic-Christian National Holiday”; thus becoming the first joint formal holiday in the history of these two religions). The article, “Lebanon: How the Annunciation came to be a joint Muslim-Christian national holiday” (by Marialaura Conte, 29.03.2010) includes an interview with Sheikh Mohamad Nokkari, a Sunni Muslim who began the initiative after discussions with a Christian friend. A 2/20/10 meeting between Pope Benedict XVI and the Prime Minister of Lebanon in which the matter was to be discussed is mentioned here in the article “Beirut, ‘national’ Islamic-Christian holiday in the name of the Annunciation of Mary” (by Fady Noun, 02/19/2010). The Catholic News Service article “Lebanese sheik helped get Annunciation recognized as national holiday” (by Doreen Abi Raad, Mar-24-2010) states that Lebanon’s Prime Minister confirmed the decision to approve the holiday at that Vatican meeting. Click here for the Zenit article “Marian Feast Named Holiday for Muslims, Christians” (By Tony Assaf, March 01, 2010) — toward the end are the remarks of secretary general of the Christian-Muslim Committee for Dialogue Mohammad Al-Sammak on his efforts to help establish the dual-faith holiday. One of the most famous and affecting depictions of The Annunciation was painted by an American artist — Henry Ossawa Tanner — in 1898 (click here to see the image): “The Philadelphia Museum of Art…has a magnificent and well articulated Catholic collection…and besides that, there is the most impressive picture of the Annunciation I’ve ever seen in my life, done by America’s first great black artist, Henry Ossawa Tanner–his father was a bishop of the African Methodist-Episcopal Church….Did you ever see the picture of the Annunciation where the archangel is just a shaft of shimmering white light, and the Virgin is sitting there like this, and the appointments of the house are Mexican Indian–the rug, everything–and you say, “Why did he make it look Mexican?”–because if you go back and look at the face, it’s the face of “Our Lady of Guadalupe,” but wearing an expression, a slight expression. Tanner couldn’t work in this country because of prejudice, and he worked in France–the name of this painting is La Anunciación–and “Our Lady of Guadalupe” was immensely popular among the Catholic intelligentsia before the First World War.” Source: Side 2 of Tape 3 (entitled, “Why You Should Be Hopeful”) of the four tape set “Exposing the Real Church Scandal” [talk given by Fr. Benedict Groeschel] published by Crisis (www.CrisisMagazine.com). Note: The work’s alternate French title is, L’Annunciation. The Fleur-de-lis (Fleur de lys) symbol is often associated with and used in depictions of the Annunciation. The symbol is thought to be based on the shape of the lily (which often represents the purity, and therefore the Virgin Mary as well) and is also associated with the angel Gabriel in Annunciation art. Several religious orders have been named for the Annunciation (Annunciades, Celestial Annunciades, Annunciates Of Lombardy, and Annunziata (mostly women religious except for the last of the four, which includes men as well). There is also a charitable “Archconfraternity of the Annunciation” in Rome dating back to the 1400s that has raised money for poor young women who want to marry or enter religious life (at one time in history the Pope presided over their annual ceremonies on March 25th presenting the award certificate). One of the chivalric orders of knights was named for and dedicated to the Annunciation. The “Order of the Most Holy Annunciation” has its origins in the 1300s, making it the second most ancient of the surviving royal collar orders. The collar badge of the order depicts the Annunciation and is worn on the feast day.